The man rushed out of his smoke-filled apartment building. Across the street, fellow tenants huddled together waiting for the fire trucks. As he joined them, he noticed a young girl sitting alone by the curb of the road. Heavy sobs shook her little body and a steady stream of tears fell from her eyes. He was drawn to her. As he approached, he spoke softly, then knelt beside her and placed a gentle arm around her shoulder. "Are you okay, little one?" She nodded, but did not speak. "Are you hurt? Is that why you are crying?" She looked up, shook her head, and spoke for the first time. "I didn't mean to! I really didn't mean to!" she squeaked. "All I wanted to do was see how it felt." He gave her a gentle squeeze. "What was it that you didn't mean to do?" Her little body sagged beneath the weight of her guilty conscience. More gentle prodding and the man discovered that the little girl had been trying to light a cigarette. One of the matches accidentally fell from her hand and caught the curtains on fire. The news was overwhelming. He didn't know what to say. He didn't know what to do. With a heart full of sympathy, he squeezed her a little tighter. "It will be okay," he whispered. "No! You don't understand!" she cried. "My mom came home drunk. She passed out on the couch and she's still in there!" Immediately, the man leapt to his feet and rushed back into the smoke-filled building. With great urgency, he located the apartment and kicked down the door. He screamed the woman's name and threw furniture out of his way as he searched for her. Through the deepening haze, he could see the woman's motionless body still lying on the couch. He rushed to her. He shook her shoulders violently and with great harshness he shouted into her face, "Wake up woman! Wake Up! This building is on fire!" Moments later, the man staggered out of the building, half carrying and half dragging the woman to safety. Q: Would you say the man was unbalanced? Would you say it was unreasonable for him to respond to the little girl's situation in one way and respond in another way to the situation of the mother? Our culture is going up in smoke. We need a Hero! Some of us seek the niceties of a mild-mannered good news reporter while others seek the justice of a man of steel. In truth, Jesus is both. In truth, He expects, NO HE DEMANDS, that anyone who wishes to follow Him take upon themselves the same balanced nature. Q: Would Jesus approve of the way Christians are confronting the cultural chaos of our day? Would He be disappointed to know that some Christians respond with silence? Would He support the posts we are making on Facebook and other parts of social media? Would He encourage Christians to give moral balance in political affairs or would He say that political debate damages evangelistic outreach? Would He acknowledge the present doomsday preaching and tell us to cleanse some temples or would He tell us to just relax in grace and accept that God's purpose will be done regardless? Recent celebrations which were marked by young Christians posting rainbows and "Love wins!" banners all over the internet has brought me to one very sobering conviction - someone dropped the ball. Somewhere along the line, the Christian teaching of parents and church leaders has been overlooked. Either our values were heard and rejected or we did not speak loud enough for them to be heard over the noise of the world. I'll let you decide, but either way, the message is still being overlooked! It is the purpose of this series to examine the ultimate authority, the ultimate life example of Jesus - the ultimate Hero. In this material, we will examine His words and reactions while asking the questions, "What would He do today?" and "How would He decide which reaction to choose?" Jesus is the literal dynamic Who holds all things together. To set the stage, it is important that we first understand the balanced nature of our Lord. "For in him all things were created: things in heaven and on earth, visible and invisible ... all things have been created through him and for him. He is before all things, and in him all things hold together." Jesus is the literal dynamic Who holds all things together. It is He Who keeps the sun at just the right distance from the earth. It is Jesus Who controls the tides and keeps the sea from overwhelming the shore. It is He Who combines the egg and the sperm to create human life. It is He Who governs all created things, visible and invisible. Jesus is the Lord of balance and He expects His followers to live by His example. In Luke 12, Jesus presents an interesting description of God's balanced approach toward humanity. At the conclusion of this passage, He also presents a sobering application to His followers. "I tell you, my friends, do not be afraid of those who kill the body and after that can do no more. 5 But I will show you whom you should fear: Fear him who, after your body has been killed, has authority to throw you into hell. Yes, I tell you, fear him. 6 Are not five sparrows sold for two pennies? Yet not one of them is forgotten by God. 7 Indeed, the very hairs of your head are all numbered. Don't be afraid; you are worth more than many sparrows." 8 "I tell you, whoever publicly acknowledges me before others, the Son of Man will also acknowledge before the angels of God. 9 But whoever disowns me before others will be disowned before the angels of God." Please notice the odd combination of admonishments within the first paragraph. First, Jesus harshly warns His listeners to fear God because men only have the ability to kill the body but God has the authority to throw a person into hell (verses 4-5). Then, without even a break in thought, He transitions into words of gentle comfort; reminding His listeners that God sees and cares for even the hairs on their head (verses 6-7). Q: What does this odd combination of admonishments tell you about God? A: He is a God of balance! To those who see God as a harsh, hellfire and damnation type Deity, I would say this, your relationship is only one-sided. Be careful lest Satan trap you into accepting a God Who is less than balanced. To those who see God as a gentle, warm fuzzy type Deity of grace and tolerance, I would say this, you too only know one side of Him. Be warned! Satan wants nothing more than to convince you that it is enough to worship just 50% of His nature. And then there is that sobering application Jesus makes at the end of this passage. Read verses 8-9 again. Directly on the heels of this striking dichotomy of God's nature, Jesus presents a very sober warning - be sure to publicly acknowledge Him before others or you will be disowned by God! Q: What is the connection between God's nature and the warning Jesus gives immediately following? A: In order to be like God, our public acknowledgement of Jesus must emulate the nature of God. It must be balanced. But that, of course, raises another question, "How do we know which response is appropriate in each situation?" In the final part of this series, we will answer that question. But before doing that, it is important for us to further establish the complete nature of God. It is vital that we examine the complete living example provided through the God/man, Jesus. In the next section, we will begin an eye-opening examination of "The Abrasive Savior." Many will be surprised to find out that Jesus didn't always take the "nice guy" approach. With regularity He used an "in-your-face" presentation of His message and did, on several occasions, bait the audience with intentional combativeness. It may also be a surprise to discover that not all of His abrasiveness was directed at religious leaders. Jesus had a lot to say about social issues, race relations, and even politics. He engaged in debate (Mark 12:28) and He understood the necessity of a spirited defense. His example must not be overlooked! The Lord of balance is calling His people into the realm of public expression. Know His nature. Be like Him. Make it real! Gentle Jesus? Not Always! 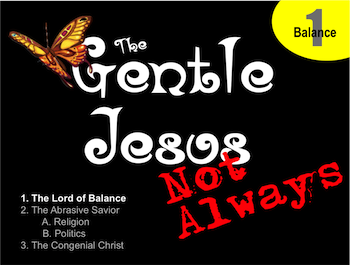 : "The Abrasive Savior: Religion"
Gentle Jesus? Not Always! : "The Abrasive Savior: Politics"
Gentle Jesus? Not Always! : "The Congenial Christ"
Gentle Jesus? Not Always! : "Keys to Cultural Confrontation"
Back to Top of "The Lord of Balance"